Summary: The first two verses of Ephesians make up the salutation. This type of salutation was the usual way of starting a letter in Paul’s day. The custom was to give first the name of the writer, then to identify the reader and finally to express greetings. The first two verses of Ephesians make up the salutation. This type of salutation was the usual way of starting a letter in Paul’s day. The custom was to give first the name of the writer, then to identify the reader or readers and finally to express greetings. Paul in his letters followed this pattern. However, he always gave it a decidedly Christian flavor and varied and amplified it according to circumstances. Evidently, the Ephesians letter was originally circulated as an epistle intended for all the churches of the Roman province of Asia (of which Ephesus was the capital city). 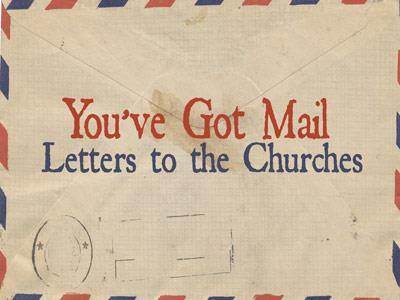 The church at Ephesus likely received this letter first, and later was entrusted with its safe keeping. Thus the letter eventually became identified exclusively with Ephesus. “Paul, an apostle of Christ Jesus.” Ancient correspondence—like its contemporary counterparts—opened according to a traditional formula. Our practice is to write the recipient’s name at the beginning and the author’s signature at the end. Modern e-mails have reverted to the more sensible ancient form in which the names of both the writer and the recipient were given first, usually followed by some words of greeting. Paul (his name means “small”) adopted this basic formula in almost all of his letters. Only in his strongly worded letter to the Galatians did he refrain from all expressions of thankfulness to God for his blessings on the recipients. 1) The apostles received their commission directly from the living lips of Jesus. Paul made that claim for himself. He wrote, “Paul, an apostle, (not of men, neither by man, but by Jesus Christ, and God the Father, who raised Him from the dead)” (Galatians 1:1). This is the reason I believe Paul took the place of Judas. The disciples had selected Matthias, but I don’t find anywhere that Jesus Christ made him an apostle. Apparently all the apostles received their commission directly from the Lord Jesus. 2) The apostles saw the Savior after His resurrection. Paul could meet that requirement. 3) The apostles exercised a special inspiration. They expounded and wrote Scripture (see John 14:26; 16:13; Galatians 1:11-12). Certainly Paul measures up to that more than any other apostle. 4) They exercised supreme authority (see John 20:22-23; 2 Corinthians 10:8). 5) The badge of their authority was the power to work miracles (see Mark 6:13; Luke 9:1-2; Acts 2:43). I do not believe such power is invested in men today. That was the badge of an apostle. John wrote at the end of the first century, “If there come any unto you, and bring not this doctrine, receive him not into your house, neither bid him God speed” (2 John 10). The badge was no longer the ability to work miracles but having the right Doctrine. 6) They were given a universal commission to found churches (see 2 Corinthians 11:28). Paul definitely met these six requirements for apostleship. Paul was born on the island of Tarsus, and since the time of Pompeii (106-48 B.C. ), Citizens of Tarsus had enjoyed the privilege of Roman citizenship. Paul used this to his advantage on more than one occasion (Acts 16:37; 21:37-40; 22:24-29). Thus by birth he was a citizen of two worlds, a Hebrew of Hebrews (Philippians 3:5), but also a citizen of Rome. He was Saul (his Jewish name), proud descendant of Benjamin. But he was also Paul (his Roman name), free born Roman citizen. Saul of Tarsus became Paul, the apostle to the Gentiles (Acts 9:15). While he was ministering in the church of Antioch, he was called by the Spirit to take the Gospel to the Gentiles, and he obeyed (Acts 13:1-3). The Book of Acts records three missionary journeys that took Paul throughout the Roman Empire in one of the greatest evangelistic endeavors in church history. About the year 53, Paul first ministered in Ephesus but did not remain there (Acts 18:19-21). Two years later, while on his third journey, Paul stayed in Ephesus for at least two years and saw that whole vast area evangelize (Acts 19:1-20). During these years, he founded a strong church in the city that was dedicated to the worship of the goddess Diana. For a description of Paul’s ministry in Ephesus, read Acts 20, and for an explanation of the opposition to Paul’s ministry there, read Acts 19:21-41. The first two verses of Ephesians make up the salutation. This type of salutation was the usual way of starting a letter in Paul’s day. The custom was to give first the name of the writer, then to identify the reader and finally to express greetings.